Dec 10, 2003 — The weekend snow storm delayed them, and they did need a clutch last-second shot to clinch it, but the Lady Macs won their third consecutive championship at the Betty Shabazz Memorial Women’s Basketball Tournament at Medgar Evers College. The storm pushed the opening round of games to Sunday afternoon, December 7, instead of Saturday night. YU faced Hudson Valley Conference foe, SUNY Purchase, in the first game of the day. After a tight first half that ended tied at 30, the Lady Macs broke open the game early in the second half and coasted to a 64-47 triumph. Point guard Shayna Greenwald, a native of Toronto, led the way with 20 points and 8 steals, while Debbie Ginsberg added 10 points and 7 rebounds. The team shot an impressive 50% from the floor overall. In the championship game, played Monday night, YU faced tournament host Medgar Evers, who had defeated Polytechnic University in Sunday’s second game. The game was close throughout with the lead changing hands on almost every possession. With time running out and Medgar Evers up by 1, after a scramble under the basket, the ball was passed to co-captain Shayna Greenwald who drained a 3- ointer with less than 3 seconds remaining on the clock, giving the Lady Macs the lead and the championship 57-55. 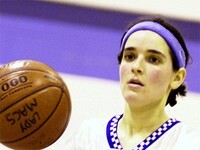 Ms. Greenwald led all scorers with 24 points and added three assists and a steal. Blair Chaletzky chipped in with 10 points, while Debbie Ginsberg, and Jessica Epstein, controlled the boards, each pulling down 11 rebounds. Following the game, Shayna Greenwald was named the Most Valuable Player of the tournament and Blair Chaletzky, of Boston, co-captain, was named to the All- ournament team. The Lady Macs are now 6-0; the best start in team history, and await the tough York College team’s visit on Monday night at 7:30pm.